My friend and hairdresser Elly and I have an arrangement. I make birthday cakes for her kids and she cuts my hair. Don't you love friendships like that? It wasn't a formal sort of arrangement and it just sort of evolved and happened over the years. 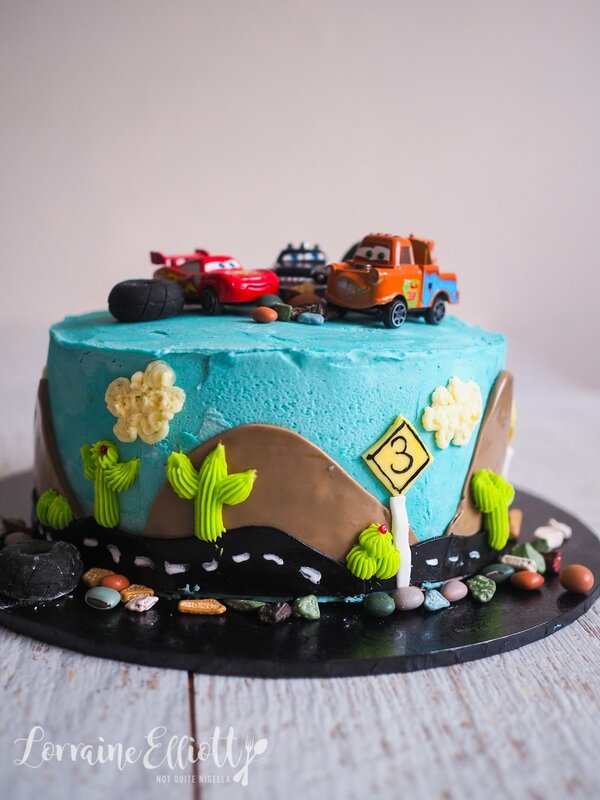 Anyway her 3 year old son Nate has had an alien cake, a dinosaur cake as well a baby shower cake before he was born and this year he asked for a Cars cake. Elly mentioned that she doesn't really like the taste of fondant. I understand, a lot of people don't. And usually they lift it off and leave it behind. However fondant has a lot of pluses. You can leave it to sit at room temperature and it acts as a barrier to prevent cakes drying out. But buttercream does taste better and she asked if I could make Nate a buttercream cake. 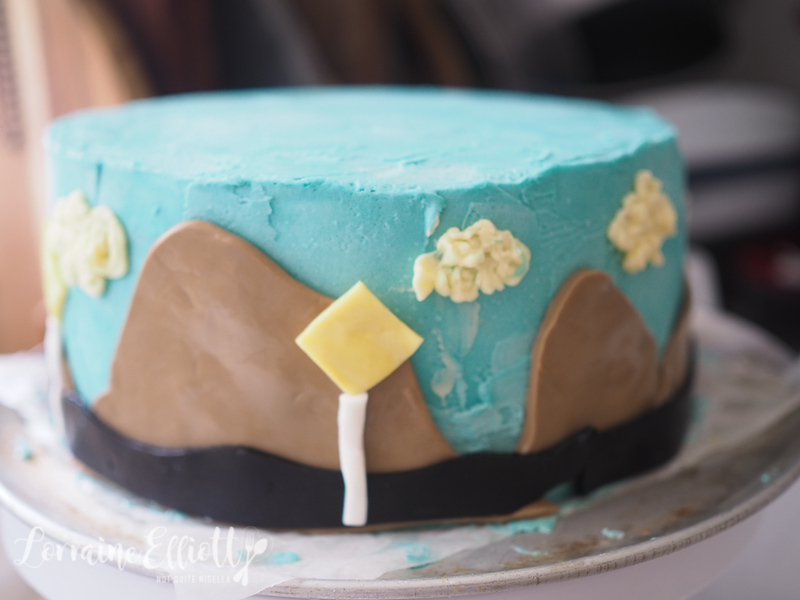 At the moment it is pretty warm in Sydney being mid summer and I was a bit (okay very) nervous about doing a buttercream cake. Especially as the day before there was a forecast for a 38C/100F day the day before she was picking it up. I cleared my fridge and made sure that there was plenty of space because while buttercream can act as a barrier when it is hot, it can also melt. I got PTSD flasbacks to when Mr NQN's sister Amaya asked for a buttercream cake on her wedding day in January that was held in an non air conditioned surf club. I think Elly and I must have messaged a hundred times back and forth. We decided that it would be fine as long as it was kept in the fridge until serving. She drove it back to where she lives on the central coast, air conditioning running at full blast. Like Amaya's wedding, Elly kept the cake in the fridge the whole time only bringing it out just before it was served. Nate was so excited when she took it in the car and the cake was thankfully a fully intact hit and there wasn't a crumb left as it was devoured. I realised one thing about myself when I was making this cake. I like to think that I notice details but I think I'm a more big picture sort of person. Because I didn't notice any of the flaws until after I photographed it. Like the tiny dots of blue buttercream on the brown fondant or the bits of cornflour that I should have brushed away before photographing it. I'm terrible at Photoshop so there was no way that I could get rid of them. Hopefully Nate isn't a detail oriented kid and more big picture and didn't notice that too! 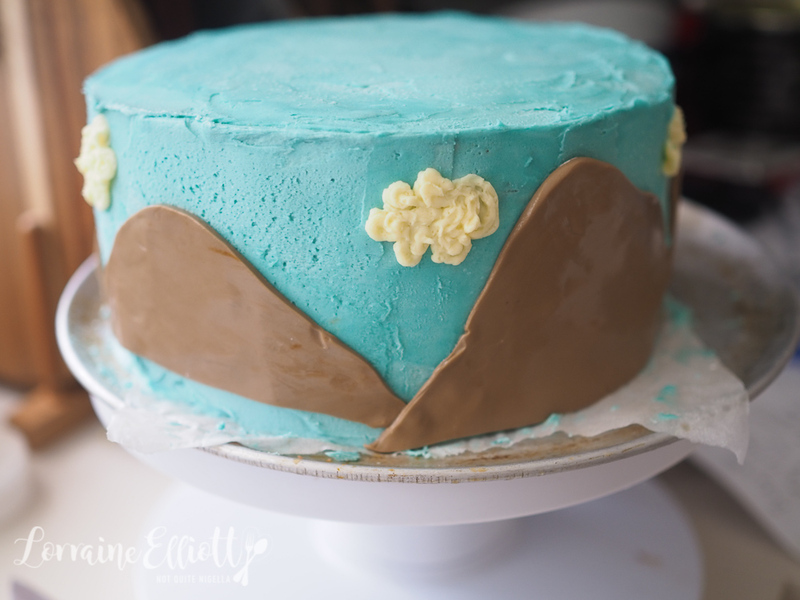 So tell me Dear Reader, do you like fondant cakes or do you prefer buttercream? And are you a big picture or detail person? Do you have any friendships where you barter skills? Tip: If it is warm or hot you will need to make use of your fridge so clear space in your fridge to accommodate this cake. Step 1 - Preheat oven to 150C/300F and line 2x 20cm/8inch tins on the base and sides with parchment. 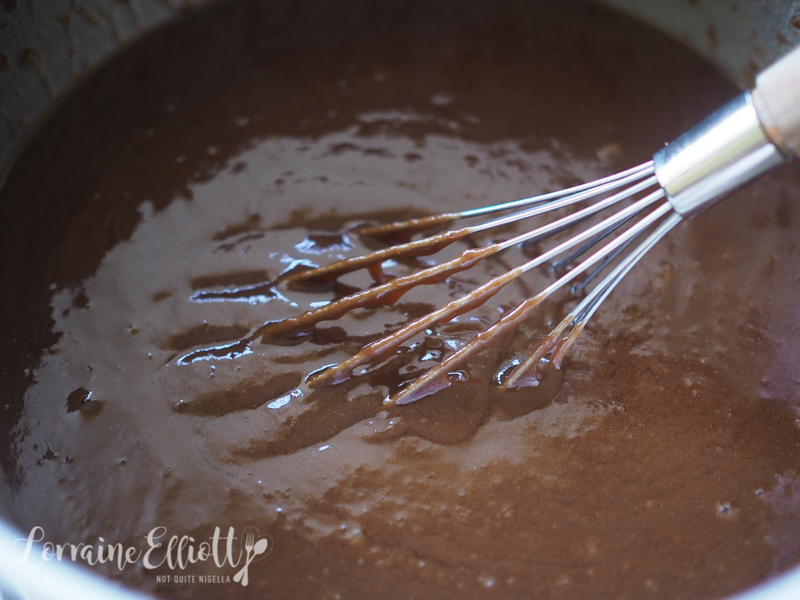 Melt the butter, chocolate, sugar and water together in a large pot on medium heat stirring. Remove from heat and allow to cool for 15 minutes. Whisk the eggs in. Step 2 - Whisk the flour, cornflour, cocoa and baking powder in a large bowl. Add the chocolate mixture in slowly stirring well but try not to overmix (if you get too many lumps pass the mixture through a sieve). Divide among the two tins evenly. Bake for 1 hour and 30-45 minutes or until the centre springs back when touched. Cool completely and wrap. You can make these cakes a day ahead of time. Step 3 - It makes the cakes a bit easier to work with if you trim them, halve them horizontally and place each layer in the freezer separated by parchment. This is optional and is mostly helpful in hot climates. Step 4 - Make the buttercream. Beat the butter until smooth and then on slow speed add the sugar and vanilla and then increase the speed. Add a tablespoon or as much milk as you need to get a spreadable consistency. Step 5 - Reserve 1/2 cup of white buttercream. Then tint the buttercream sky blue. Place one layer of cake and spread with buttercream. Place another on top and repeat until you have used all four cake layers. Spread a thin layer of buttercream around the cake-this is the crumb coat to catch all the crumbs. Refrigerate the cake for 30 minutes so the buttercream hardens. 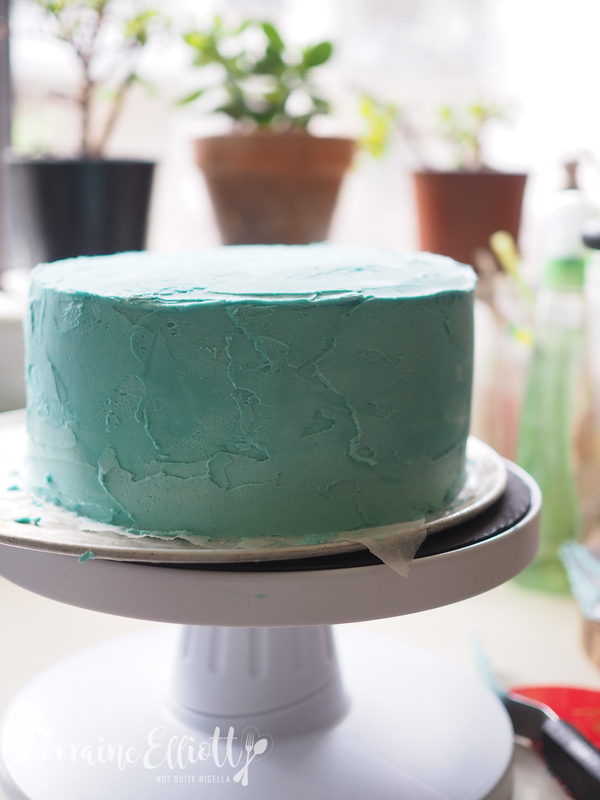 Step 6 - Spread a thicker coat of buttercream on the outside and smooth with a scraper or a long metal spatula. Refrigerate until needed. Step 7 - Make the fondant decorations. 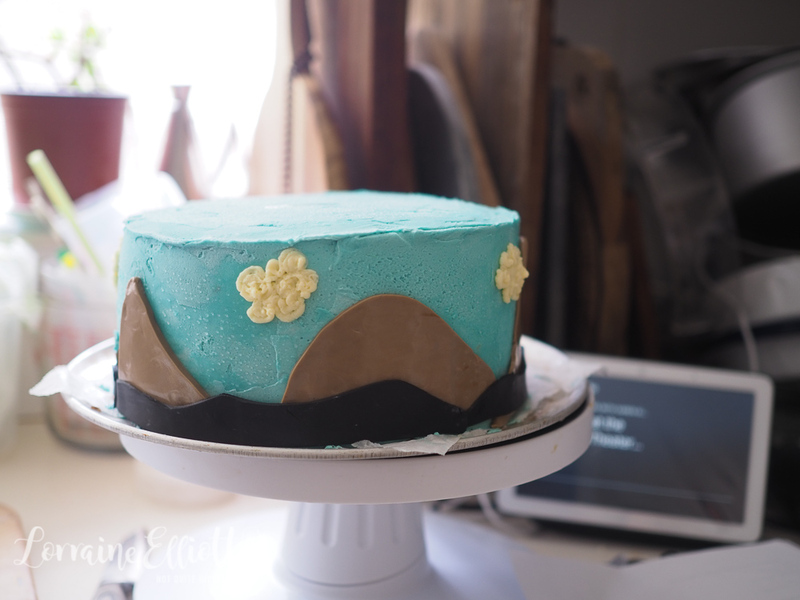 Colour fondant brown and cut out mountains in different heights. 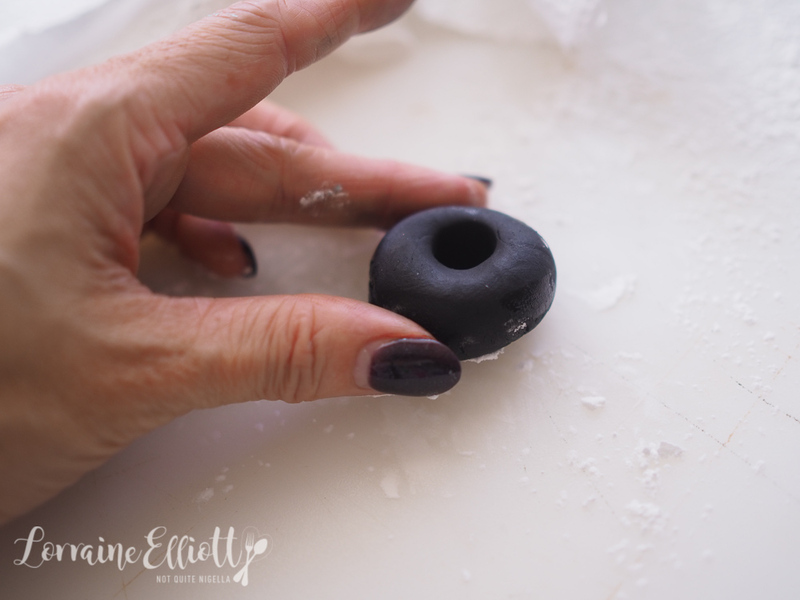 Then use the black fondant for the road. 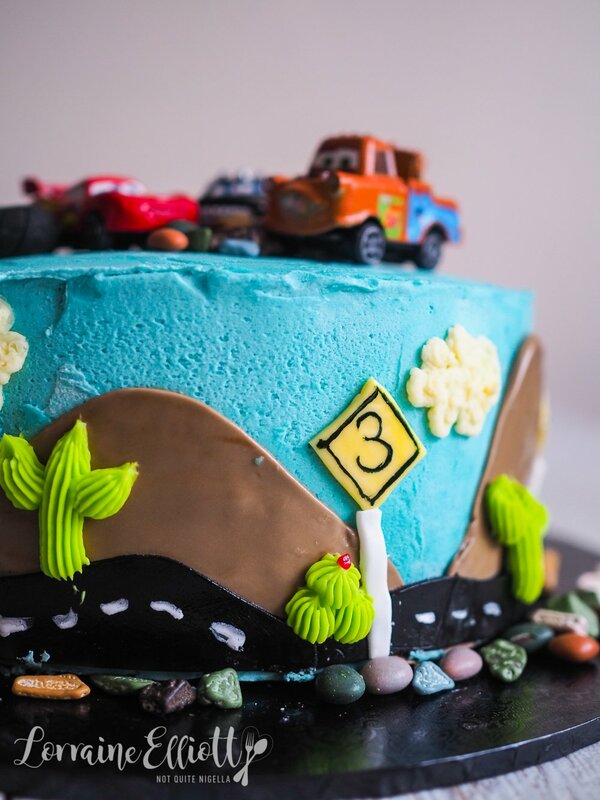 Use white and yellow fondant for road signs. 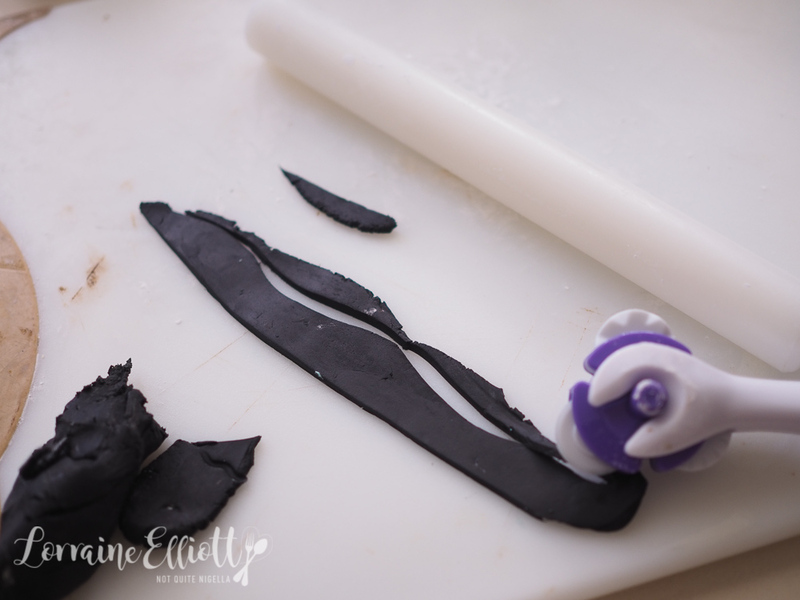 I also shaped some black tyres out of fondant drawing the treads with a paring knife. The decorations will stick straight onto the buttercream without any edible adhesive. 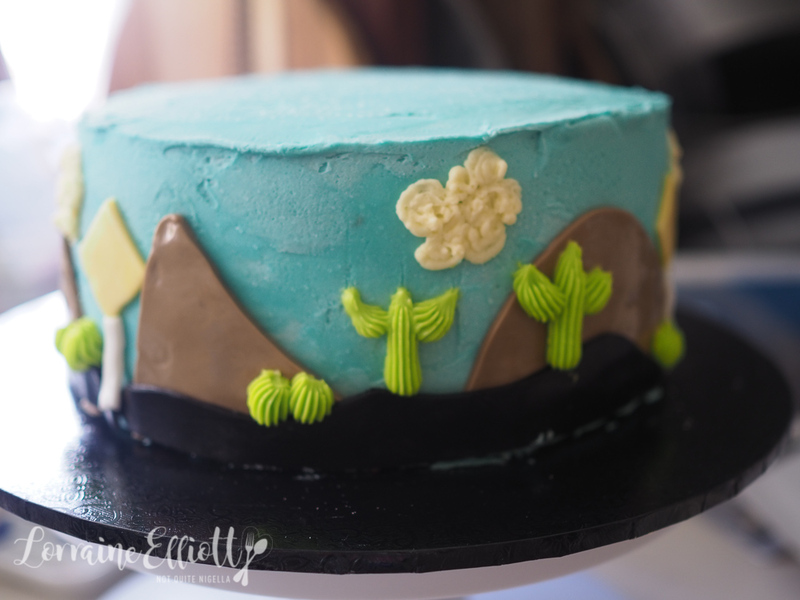 Step 8 - I piped white buttercream for clouds using a plain #1 tip and then tinted 1/4 cup of it green for cacti. Use a #199 piping tip and pipe the middle stem and then the two side branches of the cactus. You can also use red piping gel for flowers or sugar flowers. Step 9 - Take white on white colour and draw markers on the black road around the cake. Draw the child's age in the road sign with edible black gel and a fine paintbrush. 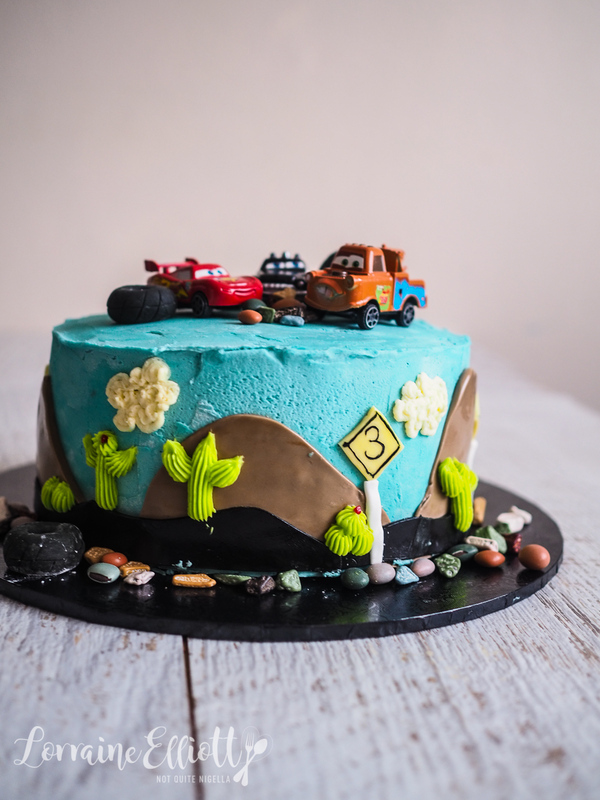 Top with toy cars, tyres and chocolate rocks. Store the cake in the fridge in warm or hot weather. recipe7 Cake Frosting Recipes That You Have To Try! featureThe Strawberries & Champagne Can-Can Cake! recipe 7 Cake Frosting Recipes That You Have To Try! feature The Strawberries & Champagne Can-Can Cake! recipe The Amazing Watermelon Cake!